It's taken a while but I've finally got round to joining the owners club. I'm Richard, from Suffolk and have a bit of an obsession with Corollas. 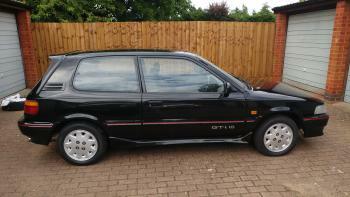 I've currently got 3, a 1990 Gti, a 1991 GL Saloon and a 1992 Hatchback. I'm now looking for 4 additional cars to add to the collection, 3 more corollas (a GXI, a G6R and a TTE Compressor) plus an MA61 Celica Supra. Check the "Wanted" section for more details, especially if you know the whereabouts of any!